“No, you can’t” – Someone should really have the guts to say it. Forget O’Bama. Forget those who believe they can do whatever they like. None of this “Is féidir liom” stuff. They can’t. No they can’t. And we should tell them in no uncertain terms. I mean, just because you can get away with it, it doesn’t mean “you can”. 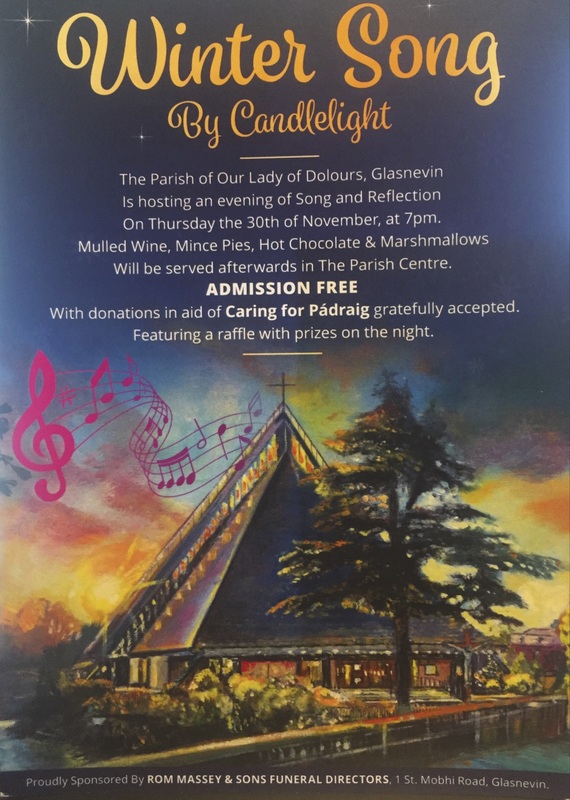 If you are in Dublin, join us in the Glasnevin Parish of Our Lady of Dolours for Winter Songs, followed by mulled wine, minced pies, hot chocolate and marshmallows – and a huge raffle in aid of Caring for Pádraig! Finally, and coming back to the beginning, the need to say “No, you can’t” – what would you tell someone who had a contract to work 37 hours per week in the public service but only worked 13, spending the remainder of the time working with private clients and charging them high fees? Exactly! You’d give them the slightly adapted O’Bama quote: “No you can’t”. And fair play to Irish Minister of Health, Simon Harris, to call this practice “immoral“.